When you can’t hear God. I am reluctant to say that I struggled with times of unbelief over the past few years. It was a very dark place spiritually and emotionally because I could not hear God. God – if you are so good, and loving, and BIG – then why am I facing these struggles? Why when I cry out to you do you not answer me with an obvious answer? Are you too busy? Can you not hear me? Why do bad things happen to your people? I have grown up with the Christian faith my entire life, I know all of the typical answers that some would suggest to me. PRAY and he will answer you! READ His word, the Holy Spirit will reveal things to you. You just need to have faith! How are you supposed have faith when you don’t understand it all? When you cannot even get God to answer you? I was then thrown into a life of constant striving. Daily devotions, serving at the church, praying constantly. I cut out things that didn’t bless me and that were toxic for my life. Go go go for God! Although those things were all good, it was exhausting. It was lonely. It was not fulfilling. My life was still static. That’s when I gave up. I told God, that BIG GOD that I knew had to be there but for some reason didn’t want to talk to me, that I give! You talk to me when you are ready. I was upset and frustrated and anxiety ridden. My thoughts were consistently racing with contradiction and questions. After throwing up my hands to Big God it started to hit me like a massive wave of revelation. That was the whole point! I feel like God just looked down and smiled, “Have you had enough already? Are you ready to let me take over?” I was weary and exhausted. I had found that I was striving so hard to hear from the God that was already near. 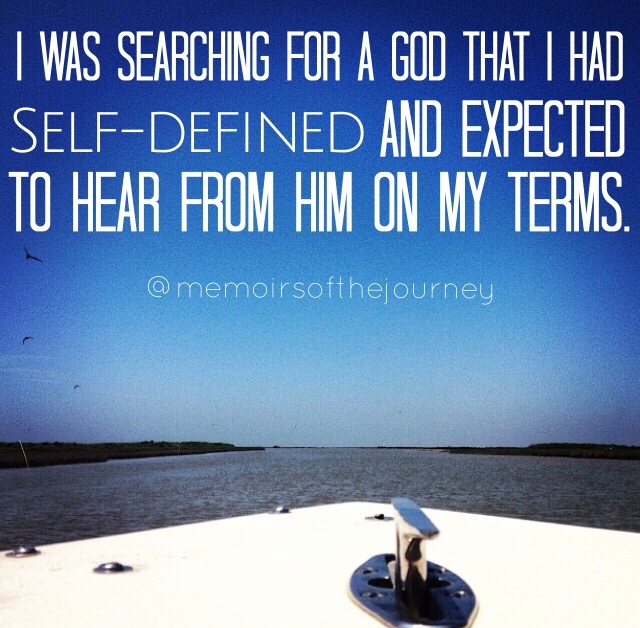 I was searching for a God that I had self-defined and expected to hear from Him on my terms. Like the only way to hear from God is to hear a big, booming voice that shakes your whole house! Or an obvious, in your face sign that says ‘Hi, I am God!’ His ways are not our ways. The Lord’s language is not the same as ours, we cannot assume he will answer a certain way just because we think he should. In 1 Kings 19:11-13, the great prophet Elijah heard from God in an unexpected way. 12 After the earthquake came a fire, but the Lord was not in the fire. And after the fire came a gentle whisper. He answered with the sound of a quiet whisper, something I never slowed down to hear. Let go and let God! Let Him reveal things to you when He deems you ready. I cannot understand biomedical engineering much less the concept of creation and the life here after. Don’t let things you do not completely understand consume you. Let it go, trust God. He has already got this whole ‘life thing’ figured out.